Lip-Smacking Vegetarian Chili So Good that No One Will Miss the Meat. 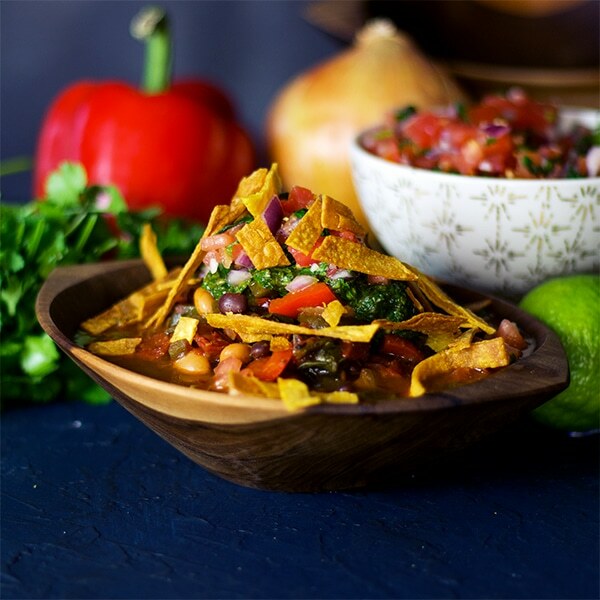 Vegetarian Chili packed with beans, onions, poblano peppers, red bell peppers, zucchini, and tomatoes that are simmered in a spicy red wine broth, then topped with chimichurri sauce, fresh Pico de Gallo, fried tortilla strips, and, if you like, some shredded cheese. This vegetarian chili is delicious all on its own, but the toppings take it to a whole other level. Chimichurri Sauce is a simple mixture of cilantro, parsley, vinegar, and oil and blends up in the food processor in just a few minutes. It’s a gorgeous, vibrant green and adds a delicious shock of flavor to everything it touches. Pico de Gallo only takes 10-20minutes to make, depending on how quick you are with a knife, and adds even more bright, fresh flavor. 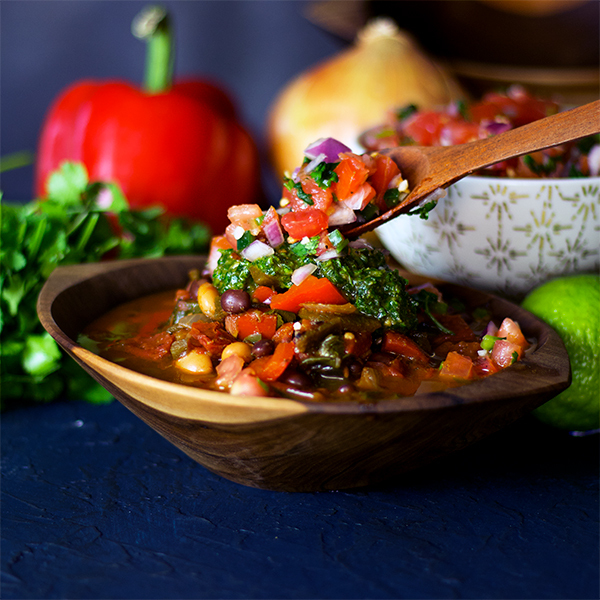 The combination of herby Chimichurri, fresh Pico de Gallo, and warm, spicy chili is crazy good. There are, of course, any number of other delicious condiments that you could add to your chili topping buffet. More chopped fresh tomatoes – in the summer, when tomatoes are soooooo good, can you ever have too many? Spoon your vegetarian chili over rice. I couldn’t include this in the list above because when eaten this way, the chili becomes a toping for the rice. Sorta. Most of the time when I make chili for my family, I also make a pot of rice because we really love to spoon warm chili over a bowl full of rice. 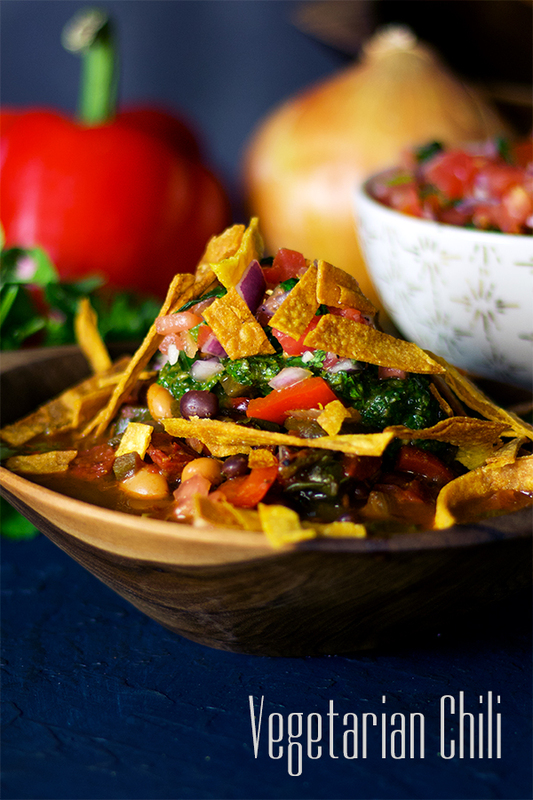 Then, we go ahead and get our toppings on, adding all the good stuff like pico de gallo, tortilla chips, sour cream, cheese…. you get the picture. What to do with leftover chili? Spoon it over corn tortillas and eggs and call it breakfast. 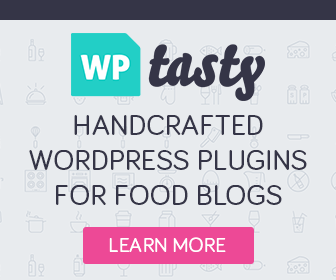 How amazing is a dish that you can serve for dinner one night and breakfast the next???? Make chili cornbread pie. So good it’s worth making chili just so you can make chili cornbread pie. Here’s what you do: Spoon leftover chili in a square baking dish. Mix together the the cornmeal topping used in this White Chili and Chorizo Tamale Pie. Spread the topping over the chili and bake at 450 degrees for about 20 minutes. YUM. Tex-Mex Sheppard’s Pie. Spoon leftover chili in a baking dish and top with Cream Cheese Mashed Potatoes. Bake at 400 degrees for about 30 minutes. 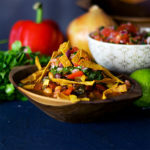 Make some chili nachos! 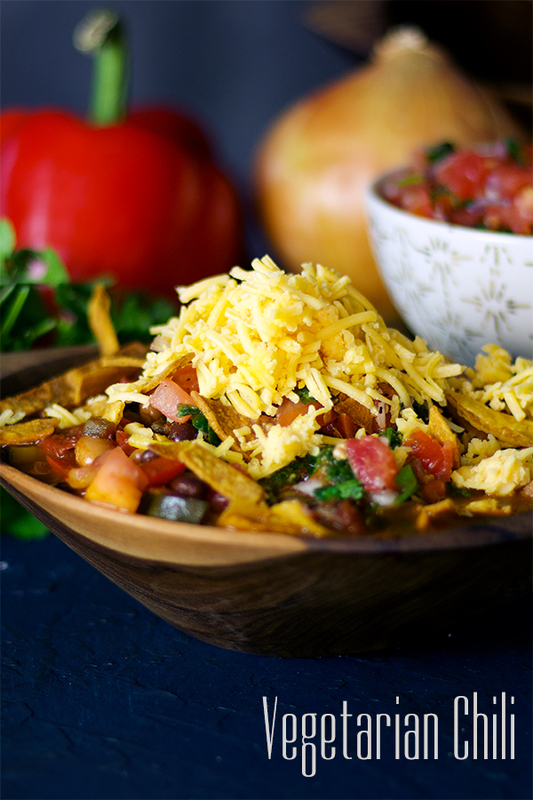 These Veggie Black Bean Nachos make a regular appearance at our house, especially on Friday nights when we have a lot of odds and ends in the refrigerator that I want to use up. Sometimes we top our nachos beans, and sometimes with Vegetarian Chili. It’s all good. Chili Mac and Cheese. Make some mac and cheese and stir leftover chili into it. Seriously SO good. Make some chili cheese burritos. Spread some chili down the center of a tortilla, top with cheese, and heat it up in the microwave to warm the chili and melt the cheese. 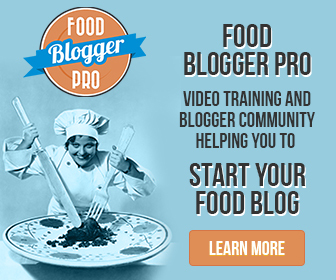 Make Loaded Baked Potatoes! Another Friday night meal that makes frequent appearances at my house when I want to use up the week’s leftovers. Chili and whatever other toppings you have around are positively delicious spooned over a warm, perfectly baked potato. 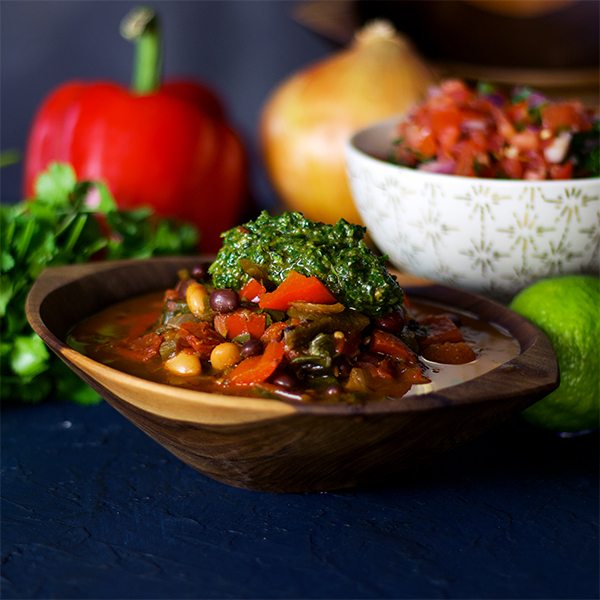 If you’re making this as a part of Weekly Spring Meal Plan #2, you should already have Chimichurri Sauce and Pico de Gallo hanging out in your refrigerator just waiting to top bowls of this soup. You might have also already fried up some tortilla strips and roasted the poblano peppers and onions, putting you way ahead of the dinner game for the night. Right on. Pat yourself on the back, pour a glass of wine, and get cooking. Thanks to your prep work, you’ll be eating a heaping bowl of vegetarian chili in no time. If not, it’s a good idea to make a couple of the garnishments before you get started on the chili. 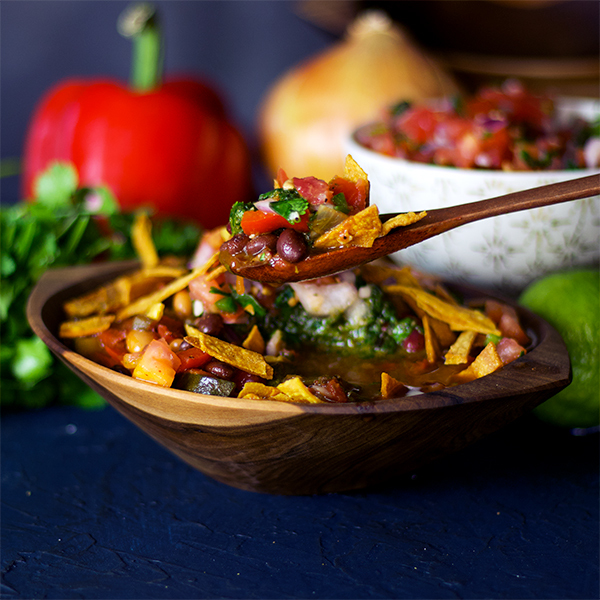 Make the Chimichurri sauce and Pico de Gallo before you get rolling on the chili. Then, follow the recipe instructions to fry up the tortilla strips while the chili simmers away on the stovetop. Serve Vegetarian Chili with Jalapeño Cheddar Cornbread or Homemade Tortillas. Vegetarian Chili is really, REALLY good with Cheddar Jalapeño Cornbread OR Homemade Tortillas. If you’re going to make the cornbread, whip up the batter before you start in on the chili. Pop the cornbread in the oven to bake while you get going on the rest. The cornbread will probably be done a few minutes before the chili… and if you dig in before the dinner bell is rung, I think that’s your just reward for being the cook. Same goes for the tortillas. Make the dough then let it rest while you get started on the chili. BY THE WAY – homemade tortillas are really easy. I just wanted to get that out of the way before I tell you how absolutely positively amazing they are. HOMEMADE TORTILLAS ARE AMAZING. 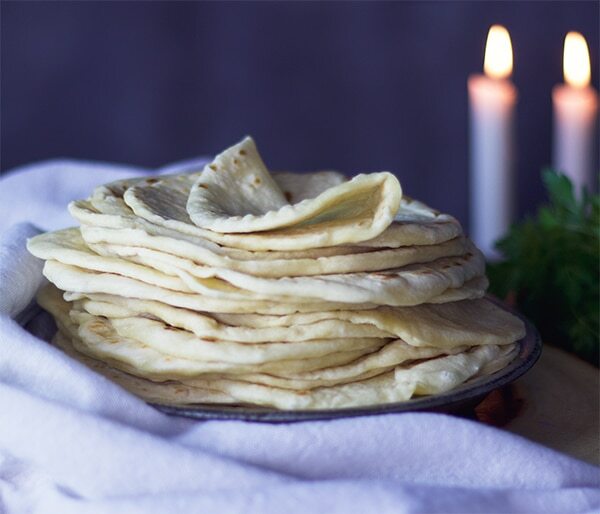 Once you make them you’ll wish you’d started years ago and will probably never purchase prepared tortillas again. Trust me on this. Perhaps an even better scenario is to recruit a helper to make the cornbread or tortillas while you focus on the chili. Or vice versa. If you’re making this as a part of Weekly Spring Meal Plan #2, serving your chili with cornbread is especially important because the leftovers form the basis of Cornbread Salad on Day #5, one of the most unusually delicious things I’ve ever made (and eaten). How much cornbread you make is up to you. 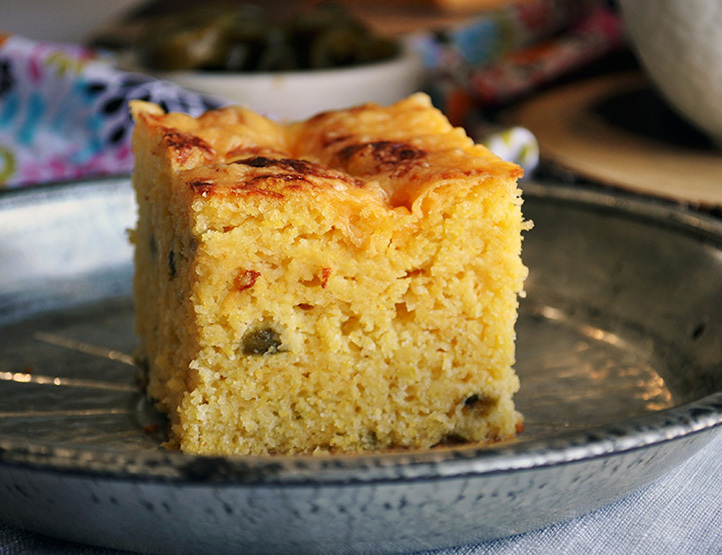 One recipe will give you 8 pieces of cornbread. You’ll need 4 pieces for the Cornbread Salad. If you think your gang might eat more than 4 pieced of cornbread for dinner tonight, or if you want a slice or two to heat up with leftover vegetarian chili for lunch tomorrow, you might want to double the recipe.